Last Saturday I attended the Minnesota Aviation Safety Seminar at Flying Cloud. I believe this was the first time in recent years when it was held at the airport instead of a hotel. I have trouble getting excited about going to an aviation seminar unless there are airplanes there! The venue was the new ASI hangar, which was stuffed with a very cool collection of airplanes. I also found a friendly bunch of human inhabitants. 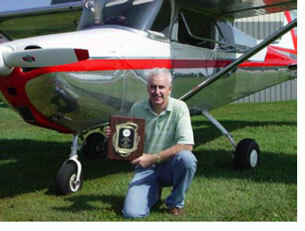 Eight years ago, I joined my first EAA Chapter, Chapter 790 in Barrington, Illinois. It wasn’t very long before I began to realize that the members of that chapter were very special, interesting people, who shared a love of all things aviation. I got to know them while I also learned to fly – from one of my fellow chapter members. Although I had been to Airventure several times, these people showed me a new way to enjoy the event by volunteering. 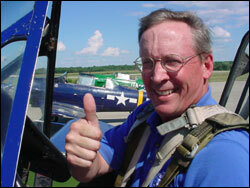 790 members were instrumental to a group called EAA Ambassadors, and at one of the Airventure events I met a guy from far off Minneapolis, who had been similarly attracted to the group. It’s hard to believe that this is my final newsletter column. I’m happy for John as he takes over the Presidency and at the same time I’m sad that I no longer get to communicate with you via the column or lead the monthly chapter meetings. During the past three years I’ve come to enjoy both of these jobs and part of the reason is, all the words of encouragement from you about what I was writing in my column and how I handled the meetings. I want to thank my wife, Sandy, for proof reading a number of my columns and correcting the mistakes or you would have THUNK English was my second language. Please allow me a moment to look back on the past three years before I look ahead.